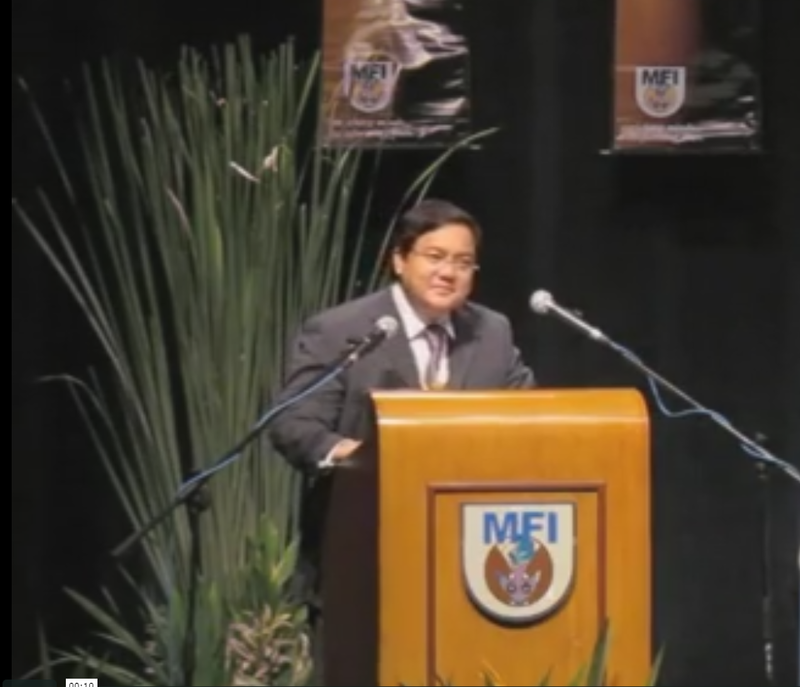 MVV’s Speech from Romeo Escobar on Vimeo. Thank you for your generous introduction, Colonel Alex Escano. Ladies and gentlemen, good afternoon. Congratulations to all of you, dear Graduates. Congratulations also to your parents and loved ones who share your sense of accomplishment today, the culmination of your long years of hard work and diligence. I am truly honored to be your guest speaker today. Being a technology person myself, I feel special having this conversation with the new graduates of the MFI Industrial Technology Program. This is the beginning of a new day. An exciting life awaits you. Talking about life’s excitements, I have three short stories for you. Just three. First is about not having a normal life. Even before I was born, my father had a debilitating eye illness that took much of his eyesight by the time I was 8. It was called nerve atrophy. With a right eye that was totally blind and a weakening left eye, he covered the 1971-72 Constitutional Convention as the official press photographer; I was his assistant. Not only would I read the newspapers for him every morning; I also took pictures myself of brilliant Convention delegates while they were forging the National Charter of our government and charting the destiny of our nation. The convention gave me an award, which was handed to me by Supreme Court Justice Felix Makasiar. The plaque says: “the World’s Youngest Professional Press Photographer.” I was just 8; it wasn’t normal. It wasn’t normal either for my father, a photographer, to lose his sight. Maybe a leg or an arm was a tolerable loss, but the eyes… The loss of eyesight to a photographer was almost fatal, more so for one with a young family. So I was pushed to work after school, joining my father and mother at the Velarde Studio located at Hotel Enrico, Ermita, Manila. I remember we had about 12 employees when business was good. Then it was just the three of us. My two siblings were still too young to work at that time. During wedding receptions and special-event parties such as graduations like this, I would take pictures of people like you here. My father would develop the negatives in the dark room and my mother would print them. The three of us would then sell these pictures at P2 pesos a copy. That was how we survived. Yet because of medical bills and household expenses, we found it hard to pay for basic necessities and the monthly rental of our apartment. My mother, like any mother, acted on her instincts and put up a small restaurant on the side. You’d call this diversification today. It put food on the table. But emergency situations were endless, so we were always trying to catch up to survive. Every two minutes was like the last two minutes of a basketball game. Desperately, we needed to make three-point shots all the time. But every time the worst came, there was always a surprise solution at the end. One day, when I was 14, my school chose me to be its representative to a Quiz Bee Contest among high schools. It was on Channel 9. I found myself on national TV. The long and short of it was, I answered the questions right and won the contest, and brought home the grand prize: a brand new Toyota Corolla 1978 model. I sold the car for P45,000.00 pesos and gave my dad the 40 thousand he and my mom needed. Medicines and the rents got paid. With the 5 thousand pesos I kept, I bought a second-hand Volkswagen Beetle and everybody was happy! That was my first taste of personal success in life. I learned that if you put hard work in what you do, like I did in my studies at that time, you prepare yourself for luck to arrive. And when luck arrives, the whole family celebrates. It was that simple… or so I thought. Well, afterwards, I learned life wasn’t that simple at all. For one, luck never always comes when you need it most, if it comes at all. And hard work never guarantees success. It is good practice, and the worse can happen to you if you don’t work hard. But hard work is no big deal, either. Many have been working hard but did not get far enough to pull out others from their own misery. Hard work is the minimum requirement just to survive. We need more than hard work to succeed. My second story is about solving problems. Going to school, working in the studio, helping my parents to survive from early morning to late evening – this was the life I knew. It was a hard life but there were fun moments, too. I was the star student in high school, at St. Anthony School in Singalong. Driving around town in my yellow Beetle with 8 or 10 of my classmates, I felt I really had it good. When I went to Ateneo during my first year of college in 1980, nobody knew me. I saw those rich kids driving numerous luxury cars. BMW. Range Rover. Corvette. I told my father about this and, lo and behold, I came home one weekend and saw my Volkswagen had just gone through a complete body work. It was painted metallic blue with the GRILL of a Mercedes Benz welded up front. My father said, “Now you have two cars: a Mercedes in front and a Volkswagen at the back!” I got so popular in Ateneo that when I delivered my campaign speeches my batch mates would say, “That’s the funny guy with a weird car!” or “That’s the weird guy with a funny car!” I don’t remember which one they referred to. But I topped the elections to the Student Council for the Freshman class of about 350 members. My father never ran out of creative ideas. He had an intrinsic talent and deep insight on small and big things. Although a few of them may have bordered on the bizarre, all were beneficial. This was the start of my discovery that even if one’s eyes cannot see much or not at all, the mind can be so powerful. Imagine giving me two cars in one! Imagine the visual amusement of his intellect from something he created but could not see. His nerve atrophy, however, remained incurable. That was what the doctors told us. Life can’t go on this way, I thought. I felt at 18 I was old enough to make a bold move. One morning, as I was reading the newspaper as I did every morning for my father, I saw an announcement that the United Nations had launched a national search for youth leaders who would represent the Philippines in the 1983 International Youth Leaders Conference in New York. I told my father I would go through the interviews and screening, and I would go to America and find a solution to our eye problem. He said, “Go and have your adventure, don’t worry about my eyes.” I said, “I will find a solution.” And I meant it. After interviews and screening, I was chosen as Chairman of the Philippine delegation, and was invited Guest Speaker at the UN General Assembly. So at 19, I left Manila for America, spoke at the UN and later on, by providence, ended up staying in the house of a topnotch eye doctor in Princeton, New Jersey. He was Dr. Earl Simon. He said nerve atrophy is incurable, but since your father still has vision, however weak, there is hope. A new therapy for the eye has been launched and an expert in low vision ophthalmology named Dr. Hooke has developed exercises for those who have weak visions. Dr. Hooke was based in Los Angeles. The long and short of the story is that a few years later, I found myself working as a news director trainee at KTLA Channel 5 News in Los Angeles. I brought my family to LA and my father underwent his eye rehabilitation. Over time, he developed a silhouette vision. He is still technically blind, but his improved vision allows him to walk on his own and dance the Tango again with his usual flair and bravado. Dear graduate, we were all born in this world with problems to solve. We don’t have the luxury to refuse or choose the problems that hit us; yet we manage to grow our lives by solving them. Later on I realized that this was the formula for creating wealth. When the country only had 6 to 8 television channels, Sky Cable provided 30 channels and revolutionized TV entertainment and Media experience irreversibly. People paid for cable subscription monthly. My compensation started at 10 thousand pesos a month and became Seven Hundred Fifty Thousand Pesos a month (P 750.000.00) in less than 10 years. I was in my early 30’s. When I learned that an E-1 line in the Philippines was priced at $2,000 dollars a month but was only $600 dollars in the US, we solved the problem by establishing a satellite hub in Hawaii, which enabled us to transmit and receive Internet signals to and from the US mainland and the various islands in the Philippines. When I got convinced children learn faster with technology, I put up Wizard Academy and produced young little wizards who mastered their early childhood academics, math and science. I sold Wizard Academy thru franchising. When I left Sky Cable, I knew someday cable TV will be delivered without the cable wire so I organized Altimax Broadcasting and developed its broadband wireless strategy. After about 8 years, Globe Telecom of the Ayala family and Singtel of Singapore needed a nationwide broadband frequency to compete with Smart. My company was the only one that had a nationwide footprint and the most competitive frequency band. They gave me an offer I could not refuse; so I sold the company to them. The sale itself made me receive an award as the top taxpayer (Onett) for 2009 in the financial capital and other commercial cities in the country. In short, I became so good at solving problems at home and for the family that I became good at solving problems of other people and the bigger community. In the process and as a consequence, I have been rewarded with more than enough resources to finance my next enterprises. My third story is about becoming successful. Who among us wants to be successful? Who wants to be a millionaire or billionaire? Raise your two feet! You may have to literally raise your two feet, I pray not, but be careful with what you wish for. A businessman friend of mine who had numerous peaks and valleys in his career found himself in a situation where he had to face numerous legal cases from failed businesses. One morning, after speaking with his daughter, he decided to get his gun and shot himself in the head. A prominent banker, an acquaintance of mine, was a victim of circumstances that pushed him to the edge, and led to his demise as well. He drove himself to the cemetery, visited his parents who had passed on years earlier, went back to his car and shot his head with his own gun. These two people were not motivated by any amount of money, huge or small. All our friends know that these two gentlemen knew that life is more valuable than success or failure. They knew that no loss of money or business would justify taking their own life. And yet they did. We cannot judge them. We can only feel, deep within us, that there may come a moment when, in the face of failure – utter irreversible failure – we’d have no face to show to the people we love, to the people who depend on us. Yes, there will be times you’ll feel that failures are unbearable, that life isn’t worth living. But failures happen all the time. I tell you, Graduates: be ready to fail. Don’t get too excited about that. It could get really ugly but be ready. When we fail, that’s the time we need the people we love to love us in return. Sometimes all we have to do is ask. Ask for love, from them and from your selves. Ask for the most important thing in your life from the ones you love the most. If they can be the reason why we could kill ourselves, then they are the reason why we should succeed. You need not have a normal life. Who’s got a normal life anyway? Aren’t we all born with problems? Why ‘problemize’ the fact that we have problems? Problems will not stop coming, not by our own doing, I hope. Just be willing to accept that problems are there while we are alive. Push your creative talents to the limits. Capture the value of the insights of others – parents, friends, and other successful people in history and of today. If you need solutions, ask around, right here, right now. Ask there or everywhere. If you still have questions, ask for answers from every person you know and even from persons you don’t know. Just enjoy solving problems. Technicians that you are, I’m sure you are no strangers to problem solving. This is your key to creating and sharing wealth. Success, if pursued for others, becomes a most deserved prize of victory. If you do all these things – not for yourself, but for something bigger than you, for someone who needs it more than you, or for a cause that is beyond your physical and material self – there is no reason for you to fail. You will definitely succeed. The ones who are successful have one thing that those who failed did not have. Their faith that things will end up well even in the darkest moments of their lives, their faith that life will end up for good even when everything seems so bad, their faith that they will succeed is deeper than anyone else’s. Our loved ones should never be a reason for us to fail in life; they should be our reason to succeed. Have the deepest faith that you will succeed, and I assure you will succeed.